Step into the past. Examine the present. Imagine the future. Open your mind. Learn from the masters. Make your mark. Keep up with Charley & Co. and all related events via our newsletter, or contact us with any questions, comments, suggestions, or anything else. 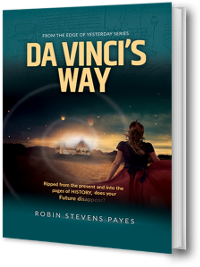 Maryland author Robin Stevens Payes discusses her book, Edge of Yesterday, about teen girl Charley Morton wants to create a time machine to meet up with her Renaissance idol Leonardo da Vinci. Robin encourages girls to love and enter STEM fields through science fiction. Kathryn interviews author, consultant & science writer Robin Stevens Payes, whose "Edge of Yesterday" book series is designed to open the minds of middle- grade readers to the adventure of learning about STEM through storytelling. Payes has created a curriculum that presents STEM through play, discovery, character, creativity and storytelling. Robin Stevens Payes recently returned from Monterey, California, where she presented the livestreamed program, "Da Vinci to Disney: How great thinkers think," with Walt Disney Family Museum educator Antonia Dapena-Tretter. It's time to dream tomorrow into life. How? By sharing stories. Why? Sharing our stories allows us to dream, build and grow together.